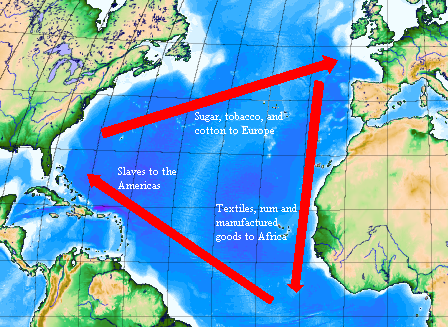 This is a classic image of the triangle trade, one I learned in history class, yet we need to embrace the map in Chapter II, which illuminates well the trade exchange between the southern New England colonies and the plantations of the Caribbean. Southern New England shipping interests as well as its merchants and farmers benefited from supplying raw materials and agricultural goods. Now read through Chapter II and extract what you think is the most important take-away for our story. Support your claim with 5-7 sentences of Standard English. By the way, can anyone find the 18th century triangle trade map from the book? I could not find it online. We need it! This entry was posted in American Studies, Homework and tagged Complicity. Bookmark the permalink. Beginning in 1648 (55), when the Pilgrims landed in Plymouth, MA, settlers were driven by the idea that these newly formed colonies were simply large-scale “business ventures” (46). With this practice in mind, colonists requested indentured servants to be sent from their homeland in an effort to take advantage of the abundant resources of the New World. This was the commencement of the triangle trade between Europe, North America, and Africa. After the motherland sent the colonists indentured servants and slaves, the colonists quickly used this labor to plant and harvest tobacco and cotton. Though tobacco was more common in the North, slave owners/masters expected that these slaves would compensate for their cost in only a year and a half (46). New Englanders soon became obsessed and reliant on slave labor as it proved to be profitable. Little did they know, slavery would soon become the backbone of the economy in both the Old and New World (55). The second chapter of Complicity delves further into New Englands history in order explaining it’s interests in slave labor. Following the colonization of New England, it became apparent to settlers that further “business ventures” to find more profitable land most be undertaken. one such venture lend to trade with the Caribbean Islands. A report between John Winthrop and his nephew describing the efficient work of the slave labor forces on the sugar plantations, sparked New Englands interests in using slaves to work northern land. Trade between the states and the Caribbean became so co-dependent that during the revolution, when trading ceased, the islands had a famine that killed 15,000 (51) slaves. Plantations in Rode Island used to raise livestock required the efficient slave labor that Winthrop’s nephew described. Rum and Molasses where also big profit items that where distributed mainly from Road Island and Massachusetts. These two items became so in demand that slave labor was also needed to produce these products at a faster rate. Trade seemed to be the main incentive for Northerners to use savory on a large scale. In Chapter two of Complicity we learn that the North’s traffic in slave commerce ran from Plymouth Rock in the Weat Indies. Bernard Baily, dean of colonial historians once said in the beginning that New England was an “unpormising barely fertile region.” Little did they know that New England would be where they found their fortunes somewhere other than the South. In 1627 Barbados not New England was becoming an area with economic progress while sugar plantations were becoming prized possesions. The English prized posession was sugar which they tried to grow in Viginia but it did not work because of the weather. A huge supply of labor was needed in order to have a sugar plantation. Boston ship made one of the earliest known New England voyages delivering to Barbados. Connecticut became famous for one crop which was molasses which they planted in the backyard of their gardens. Colonist from Massachusetts went to Connecticut River Valley to find places to plant more crops. Almost everything was transported by water including molasses and rum. In New England and New York City shipbuilding became a major industry. The change in Connecticut voyages and industries was because communication between Henry Withrop and his father. Henry contacted his father asking for indentured servants after he landed in Barbados hoping to become a farmer. Apparently enough workers were not available so his father sent him two boys. Molasses was a very important product in New England’s economy. Distilleries turned molasses into rum, another good to trade, and one that was especially pleasing to the settlers during their rough lives. The barrels of rum were then exported overseas from distilleries located all up and down the Atlantic Coast. The rum industry employed thousands of people in New England from the farmers in the sugar cane fields and distillers in the factories to those involved in exporting. People employed to export the rum ranged from carpenters who made the barrels to store the rum, shipwrights and ironworkers in the harbor building ships, and lumbermen providing the material to build the crates and ships. Some of these jobs were even high risk due to traveling on the dangerous seas. A picture on page 47 of Complicity illustrates an 1800’s plantation labor system. More importantly is the setting, the West Indies. Though these africans worked in the West Indies (a chain of islands that extends from the Florida peninsula to the coast of Venezuela and lies between the Caribbean Sea and the Atlantic Ocean), they actually are said to have subsist themselves on a diet of New England produce meat and fish. This brings New England back into the fold. New England may have been supporting (and benefitting from the trade) in the southern islands. It is interesting to note that food was not procured locally for the slaves either on the islands or from the main continent in Florida or the Caribbean sea. In chapter 2, we learned how big molasses was in early colonial history. As it turns out molasses, or sugar is probably one of the most important commodity that would later make New England a leader in the industrial revolution. The majority of slaves who survived the middle passage from the continent of Africa to the Americas ended up in the Caribbean, or Brazil. What were they doing there? They would be the labor force that drove a massive trade triangle of sugar and molasses from the Caribbean, to New England, and back over to Europe. The sugar harvested by slaves would be shipped up north, where it would be processed into rum, and then shipped off to Europe. Europe then ships fresh slaves across the Atlantic to the Caribbean. It was the processing industry in the North, that facilitated the slavery in the islands.